The Himalayan cat is a breed of long-haired cat identical in type to the Persian, with the exception of its blue eyes and its point coloration, which were derived from the crossing of the Persian with the Siamese. In Europe they are referred to as Colourpoint Persians. While the Himalayan is considered a breed separate from the Persian by The International Cat Association, it is grouped together with the Persian and Exotic Shorthair (shorthaired version of the Persian) under a "Persian Breed Group standard". The Cat Fanciers' Association considers the Himalayan a colour variation of the Persian rather than as a separate breed, although they do compete in their own colour division. 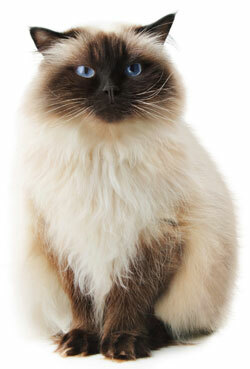 Like many long-haired cats, Himalayans need to be brushed daily to keep their coats looking their best and healthiest. In addition, they may need their face wiped daily, depending on the cat. Bathing a Himalayan is also recommended by some breeders, to help reduce the amount of oil on the cat's fur and skin. The fur on the body of a Himalayan is white or cream, but the points come in many different colours: seal (or black), blue, lilac, chocolate, red (flame), and cream. The points can also be tabby or tortoiseshell-patterned. The chocolate and lilac point Himalayans are the most difficult to produce, because both parents must carry the gene for chocolate/lilac to produce a chocolate or lilac kitten, as the trait is autosomal recessive.